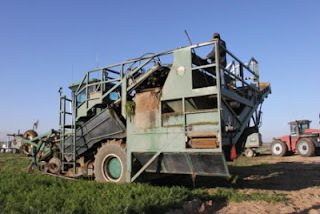 Disclosure: Grimmway Farms invited me to tour their fields and processing plant with a group of food bloggers and paid for our transportation, lodging and meals while we were there. I received no other payment for this post. All opinions and any factual errors are my own. Baby carrots taste better than they used to. I've been using baby carrots for cooking and baking for a while, as I did in the carrot halwa pictured above. In carrot halwa - a traditional Indian dessert of grated carrots simmered with milk, sugar and cardamom - the carrots really matter. The sweeter the carrots, the sweeter the pudding. Scroll to the very end of this post for my carrot halwa recipe. So why do baby carrots taste better than they used to? Because, as I learned on a recent trip to Bakersfield to visit carrot giant Grimmway Farms, they've landed on a carrot that grows sweet, long and thin. They've changed their planting methods, too, and now sow the carrots densely in the fields. 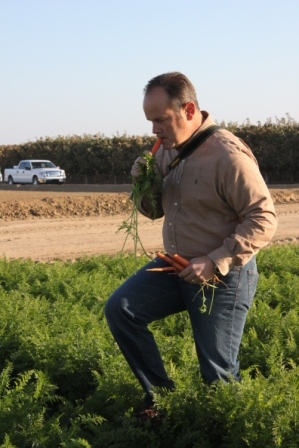 Long, thin carrots mean no woody cores and more "cuts" per carrot. Good for Grimmway (better yield) and good for us (better baby carrots). Touring the Grimmway processing and packaging facility was fascinating. There's just no way to get your head around the quantity of carrots they deal with. 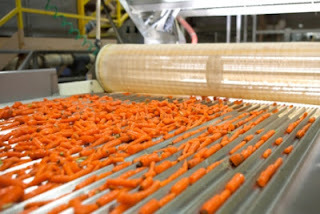 They process big carrots into baby carrots, carrot puree, carrot juice, carrot chips, carrot sticks, etc. all year. 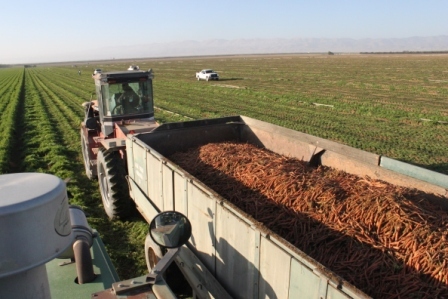 Most of the carrots are grown in and around Bakersfield, but they have fields in southern California's high desert, in the high valleys between Bakersfield and Ojai, in the Imperial Valley east of San Diego. 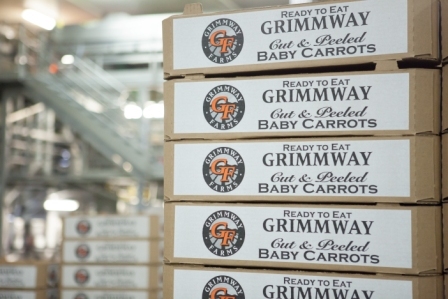 Chances are if you've bought a bag of baby carrots at Costco or your local grocery store, Grimmway grew them. 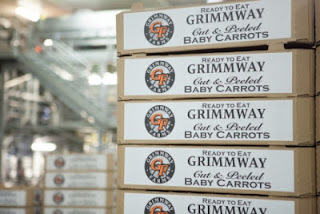 Big ag operations like Grimmway's are a good thing for one simple reason: More people in more places get to eat better food. I won't lie: It was a little jarring to see just how many steps there are between the carrot growing in the field and the bag of baby carrots in the store. The carrots are trucked from the field to the processing facility, washed, sorted for size and shape, cured, cut, peeled, polished, weighed, sorted, bagged, and packed. Taking the carrot from whole to baby is "adding value" - that is, doing things that consumers could do in their own kitchens but often choose not to. In other words, baby carrots are normal carrots with all the work taken out of them. But the upshot is that people are eating more carrots than they used to. And that's a good thing. When baby carrots are made, nothing goes to waste. The "culls" (carrots that aren't the right size or shape) become carrot juice, carrot puree, carrot sticks, carrot chips. The peels and carrot sludge left over from processing are sold for cattle feed. The tops are left in the field and turned under to enrich the soil. Even the dirt that's washed off the carrots gets trucked back to the fields. 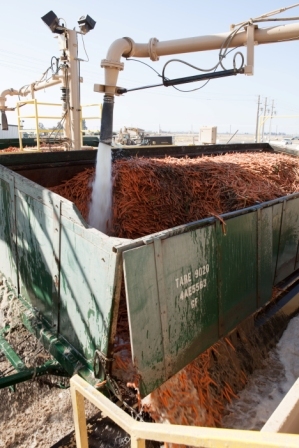 Yes, baby carrots are washed in chlorinated water as they're processed. That is a GOOD THING. I almost lost a child to salmonella a while ago and I am here to tell you that food-borne pathogens are real and scary. Believe me, you want your carrots washed in chlorinated water. It's a lot less chlorinated than the pools you swim in. And pretty much every other vegetable you buy has been washed in it too. Again, let me repeat: This is a good thing. If your baby carrots get a whitish rash on their surface, that's dehydration. Soak them in a bowl of cold water for a few minutes and it will go away. 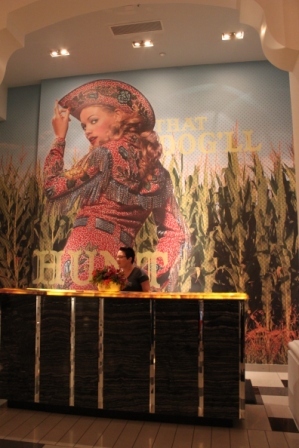 Even big farmers are still farmers. They love the smell of dirt. They hate getting dressed up. And their eyes light up when someone asks them geeky questions about yields and crop rotation. Here are a few pictures from my Grimmway visit. Scroll past the pictures for the carrot halwa recipe. Carrots after cutting but before peeling and "polishing"
And here's my carrot halwa recipe - a simple, sweet, healthy dessert. What do you like to do with baby carrots? A simple dessert featuring carrots. Using chopped baby carrots gives an even sweeter result. Serve warm with a slug of cream. 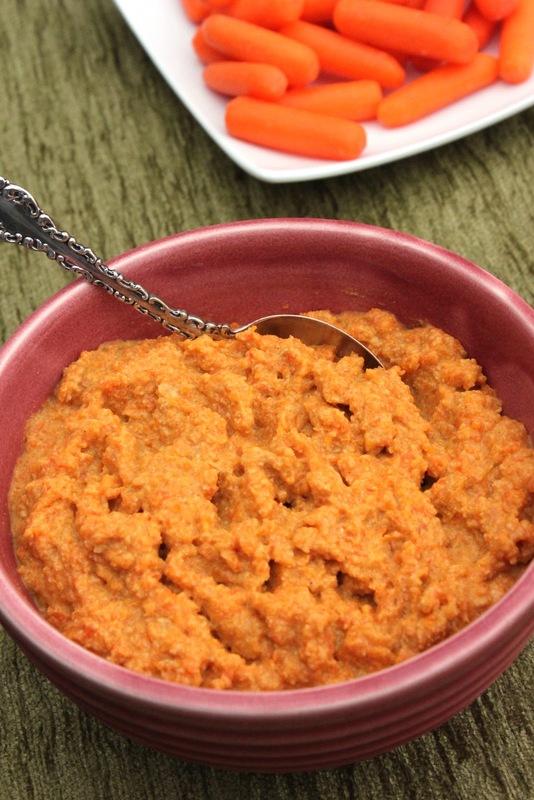 Chop or grate the baby carrots in a food processor.In a saucepan, melt the butter or ghee and add the carrots. Cook the carrots in the butter about 5 minutes, until they start to soften and the color brightens. Add the milk, sugar and salt and cook on medium-low heat, stirring often, until the milk is mostly absorbed, about 1 hour. Add the cardamom, stir, and leave to cool and settle at least 1 hour. Did something just now that I've never EVER done. Instead of immediately scrolling down to get to the good stuff (the recipe), I actually read the content of what you wrote, and discovered "other" good stuff. Very interesting read, and your writing is so inviting. Have wanted to make this dessert forever, and well....it's on the docket for this week. Agreed very nice post about carrots. I'm anxious about knowing when veggies are spoiled, I've had my fair share of getting sick from produce. So sorry to hear about your child - no one takes these things serious enough. Lovely blog, glad the recipe is so simple and doesn't need 50 ingredients.